5 Professional Oud Pick Oud Plectrum Aoud pickRisha PYRAMID made in German. C'est une abeille blanche shamisen d'éléphant pour Tsugaru. Durée : 186 mm. Sweet tone starts with Graph Tech TUSQ guitar picks! Boasting an amazingly high stiffness-to-thickness ratio, TUSQ guitar picks have a clean, articulate attack and a smooth, balanced feel. And Graph Tech's three distinct pick formulas give you three different tones - bright, warm, or deep. 5 Standard Oud Pick Oud Plectrum Aoud pick Oud Risha PYRAMID made in German. 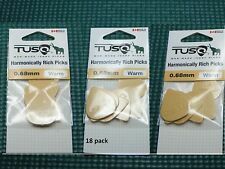 5 STANDARD Oud Pick Oud PlectrumAoud pick Oud Risha PYRAMID. Oud Plectrum has a smooth polishing and finishing. Oud pick made of finest celluloid. Thickness: 0.028". 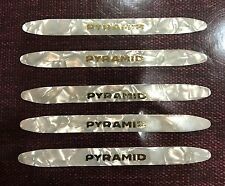 5 Professional Oud Picks Oud Plectrum pick Risha PYRAMID WHITE made in German. 5 Oud Pick Oud PlectrumAoud pick Oud Risha PYRAMID. Oud Plectrum has a smooth polishing and finishing. Oud picks made of finest celluloid. oud pick with perfect polished edges. Color: Pearl white. SEVERAL AVAILABLE. WIRE AND CABLE ORGANIZERS. MPN: PVP101. A broken string is not considered to be a "defective" product and/or "not as advertised". We hope that in most cases, this expedited order processing works in your favor, but we regret that it can make it very difficult to honor cancellation requests. 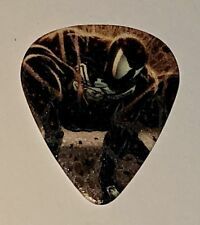 STAN LEE & PEAVEY SDCC 2013 EXCLUSIVE Spider-Man Venom Limited Guitar Pick Marvel SUPER RARE and only given to a few collectors that purchased the Spider-Man Venom Limited Edition Guitar That was only limited 100 made back in 2013 and was Sold Out Fast. This is a SUPER RARE COLLECTABLE and you probably won’t see another! Comes in brand new, never used in mint condition. A Must Have For All Stan Lee & Marvel Fans! Buyer pays $4.95 for USPS Priority Mail shipping, insurance & tracking. US bidders only. Paypal only. Please contact us with any questions. Lastly we have the Tear Drop. This shape help increase speed and accuracy for fast picking and shredding. TUSQ pick tones are all coded by colour. White is our Bright tone. If you want a clear, crisp tone with lots of top end; choose from any of our white-coloured picks. We Teach Guitar - Bass - Drums - Percussion - Oud - Ukulele by our Professional, experienced and qualified teachers. 1-1 lessons. Gitarren Plektren! Die maschinell abgeschrägten Kanten und die ausgeprägte Spitze sorgen für weniger Widerstand, eine bessere Artikulation und eine präzise Spielkontrolle. Abgeschrägte Kanten & ausgeprägte Spitze. 5 Professional Oud Pick Oud Plectrum Aoud pickRisha PYRAMID GRAYmade in German. 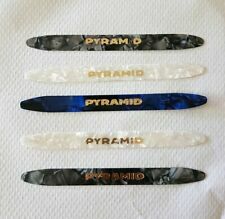 5 Oud Pick Oud PlectrumAoud pick Oud Risha PYRAMID. Oud Plectrum has a smooth polishing and finishing. Oud pick made of finest celluloid. oud pick with perfect polished edges. Stander Oud Pick Oud Plectrum Aoud pick Risha PYRAMID RED made in German. Oud Pick Oud PlectrumAoud pick Oud Risha PYRAMID. Oud Plectrum has a smooth polishing and finishing. Oud picks made of finest celluloid. oud pick with perfect polished edges. Color: Tortoise Shell. Just like in 1928, forming and finishing these finger picks by hand is a careful and deliberate process. Every pick is tested to ensure maximum comfort. Here's to comfort AND tone! After rejuvenating old picks for working pros, several suggested I try making my own finger picks. Surface lisse, ne fera pas mal aux doigts. 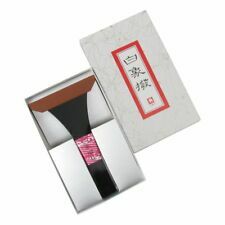 - 8 morceaux de doigt de Guzheng Picks Nails avec Groove et Arc. Tableau des tailles - Fait de celluloïd, léger et facile à utiliser. 8 morceaux de doigt Guzheng. 8 morceaux de doigt de Guzheng Picks Nails avec Groove et Arc. 8 morceaux de doigt Guzheng. - Fait de celluloïd, léger et facile à utiliser. Le forfait comprend. Parfait pour les enfants enfants adultes joueur guzheng. - 8 morceaux de doigt Guzheng. Tableau des tailles - Fait de celluloïd, léger et facile à utiliser. Parfait pour les enfants enfants adultes joueur guzheng. 8 morceaux de doigt Guzheng. - Surface lisse, ne fera pas mal aux doigts. Le forfait comprend. Parfait pour les enfants enfants adultes joueur guzheng. 8 morceaux de doigt Guzheng. Tableau des tailles Le forfait comprend - Fait de celluloïd, léger et facile à utiliser. The look and feel of tortoise shell, these flat picks from D'Andrea have smooth edges for fast, sure, picking without loss of tone. THIS IS AGAINST U.S. LAW. Professional Oud Pick Oud Plectrum Aoud pick Risha PYRAMID GRAY made in German. Oud Pick Oud PlectrumAoud pick Oud Risha PYRAMID. Oud Plectrum has a smooth polishing and finishing. Oud pick made of finest celluloid. oud pick with perfect polished edges. color : Gray. 8x Guzheng Finger Picks. Material: Oxhorn. Bending Thumb Size: approx. 25.9mm x 10.4mm/1"" x 0.41"" (L x W). Straight Finger Size: approx. 23.8mm x 10.1mm/0.94"" x 0.4""(L x W). Color: Dark Brown. Size: Small Size. Fred Kelly Speed Pick Heavy LEFT HANDED. Fred Kelly's Speed- Pick was designed to be fast on the strings. 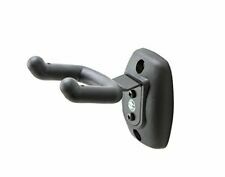 It has a comfortable, yet securely fitting thumbhole, and is available in the delrin material. An old favorite plectrum for 'strumming' the ukulele or banjo. 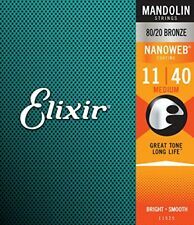 Easy and soft on the strings and comfortable to grip. Also useful for soft strumming the guitar. 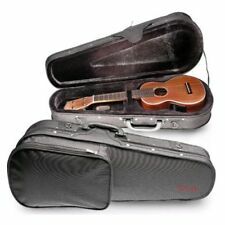 A great choice for flat picking Guitar, Banjo, mandolin etc. Professional Oud Pick Oud Plectrum Aoud pick Risha PYRAMID BLUE made in German. Oud Pick Oud PlectrumAoud pick Oud Risha PYRAMID. Oud Plectrum has a smooth polishing and finishing. Oud picks made of finest celluloid. oud pick with perfect polished edges. Color: PEARL BLUE. 8 morceaux de doigt de grande taille Guzheng. 8 morceaux de doigt de Guzheng de petite taille. - Comprend 8 pièces de grande taille, 8 pièces de taille moyenne et 8 pièces de petite taille. - Fabriqué en matière plastique de haute qualité, utilisation durable et durable. 20er Set Classic Cantabile Saz Plektren. Für Baglama und andere Saz! Zubehör für Baglama und andere Saz! Plektren für Saz. Aus Kunststoff. Saz-Plektren in bunten Farben! Wir sind Ihre Experten! 20 x Saz Plektrum. Idéal pour les amateurs et les apprenants, les débutants et les étudiants de guzheng. Le forfait comprend - Idéal pour les amateurs et les apprenants, les débutants et les étudiants de guzheng. Longueur du gland: environ 130 mm. - Idéal pour les amateurs et les apprenants, les débutants et les étudiants de guzheng. 1x ruban adhésif Guzheng. - La colle n'est pas trop collante, laisse les doigts flexibles pour se plier. The Fred Kelly polycarb flat picks have a unique fine textured grip and a slight ridge around the thumb area to ensure a firm grasp. Polycarb has an appealing transparent color, and creates a brighter sound than nylon or delrin.